For much of 2018, the growth-fueled bull run has seen U.S. equities garner much of the attention compared to bonds--their less exciting capital markets brethren. However, the recent bout of October volatility has bonds sharing the limelight as stocks have languished despite a brief rally following the midterm elections. After washing investors through October's volatility machine, the pattern continues to persist in the capital markets as the Dow Jones Industrial Average began Monday with a 600-point loss as it struggles to recover on Tuesday--a sign that investors should give bonds a closer look--fixed-income exchange-traded funds (ETFs) in particular. 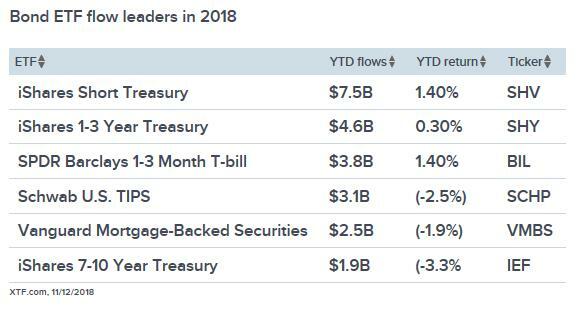 Thus far in 2018, the influx of capital has largely focused on fixed-income ETFs focused on Treasury notes. As such, traders looking to juice returns on leveraged plays in the Treasury debt space can look to ETFs like the Direxion Daily 7-10 Yr Treasury Bull 3X ETF (TYD) and Direxion Daily 7-10 Yr Treasury Bear 3X ETF (TYO) . With yields on the rise, TYO has been edging TYD this year with a year-to-date return of 10.63%. TYD seeks daily investment results equal to 300% of the daily performance of the ICE U.S. Treasury 7-10 Year Bond Index, which is a market value weighted index that includes publicly issued U.S. Treasury securities that have a remaining maturity of greater than seven years and less than or equal to ten years. It is non-diversified. TYO seeks daily investment results worth 300% of the inverse of the daily performance of the ICE U.S. Treasury 7-10 Year Bond Index that includes publicly issued U.S. Treasury securities that have a remaining maturity of greater than seven years and less than or equal to ten years. A combination of rising interest rates, a healthy injection of government debt into the markets and other external factors has made for a more lively bond market--a boon for trading activity in TYD and TYO. The sell-offs in October was partly to blame as a confluence of these factors could signal that the environment for fixed-income investors will only get more complex. However, CNBC contributor Mitch Goldberg says that this shouldn't cause investors to look the other way when bonds are mentioned. In fact, the case for more bond investments in today's market volatility is even more compelling. "So much for the safety and stability of bonds, right? Maybe, but maybe it isn't so wise for investors to dismiss bonds outright," wrote Goldberg. "With the Dow Jones Industrial Average down 600 points on Monday, 65 percent of the S&P 500 in correction (or worse) and a litany of headwinds for investors, it feels like the current bout of volatility will be with investors for a long time." "If it is indeed the case that the global economy is on shaky ground, you'd have to consider that maybe we have seen a near term ceiling in bond yields, making it more worthwhile to include bonds as part of a diversified portfolio," Goldberg added. Living Longer, But Can You Prosper?